Current Dental Terminology, commonly known as CDT, is published by the American Dental Association (ADA). CDT codes are used for reporting dental services, and CDT 2018 is the official source for up-to-date dental procedure codes. Usually ships in 48 hours. All sales final, 2018 edition. Take the guesswork out of dental coding with CDT 2018. Now published annually! 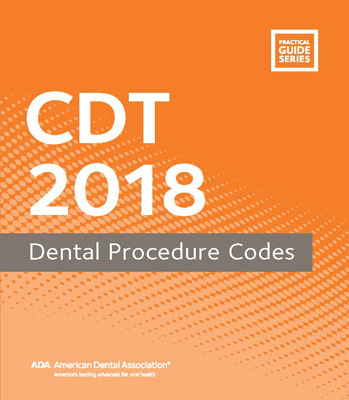 CDT 2018: Dental Procedure Codes provides updated CDT 2018 codes, as developed by the ADA, the official source for CDT codes and the only HIPAA- recognized code set for dentistry. Reduce the likelihood of claims rejection and increase reimbursement levels with more precise coding with the help and expertise of the ADA. The CDT 2018 codes go into effect on January 1, 2018. Make sure your practice is prepared.